For the second time in as many weeks, my testy mood has been dramatically improved by the prompt application of ‘relevant complexity’. Taken to the point of some irritation by relentlessly noisy and restless kids, a dose of classical music in the ear lifted my humour immensely. Above the fracas, I found solace – iPod on – listening to a collection of classical greats on ‘shuffle’ mode. One came on I ‘kind of’ recognised, but suddenly found myself very much liking. So I googled it – it is Saint-Saens Symphony No 3; aka his ‘Organ’ symphony. Pursuing my quarry, I googled Saint-Saens. Poor man. Recognised as a prodigy and polymath, he is damned with the faint praise of ‘not having up with anything genuinely new’. Just a synthesiser of the best of others and somewhat ‘derivative’. Oh dear. I was briefly tempted to back off him. But I enjoyed his ‘Carnival of the Animals’ – at the wobbly performance in which my daughter was a ‘balletic bird’ last year. So I stiffened my resolve: ‘So what if he wasn’t original’, he’s improved my Sunday mood, so let’s stick with him. Next stop a classical music website to see which of the myriad versions of Symphony No 3 on iTunes might be worth a few quid. Who? Er who else but Charles Munch, of course, composing the Boston Symphony Orchestra in 1957. Fat chance of finding that, I thought. But sure enough – and not too pricey – the original RCA recording is in the iTunes store. So I bought it. First major shock – it crackles throughout. Clearly recorded on vinyl, it’s a thumping rendition, but it crackles and pops like our old wooden Marconi record player once did. Bit of a shock to the ‘Digitally remastered’ system, but I warmed to it. RCA really should buy a new record deck though. By now an aficionado of Symphony No 3, I know: it should not be shorter than 35 minutes, nor exceed 40. The best bit, from whence the organ magisterially enters the stage, is about 7 1/2 to 8 minutes from the end. And watching it on my iPhone I discovered an innovative thing Saint-Saens does get some credit for – some cutting-edge ‘four handed’ piano playing. The beautiful tinkly piano which follows the organ is achieved by two people playing the same ‘old Joanna’ at once. Stunning. So there you have it. 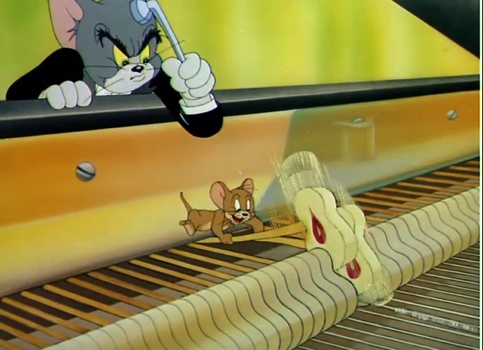 From irritation through initiation to ‘relevant complexity’ in less than a day, with some of Csikszentmihalyi’s ‘flow’ en route and even some ‘concerted cultivation’ via Tom and Jerry. The ‘adjacent possible’ is now a trip to the Royal Albert Hall to enjoy Saint-Saens live – or even better Tom and Jerry. Perhaps for the first time I ‘get’ classical music. Myriad, sounds, stories, instruments, conductors, orchestras, halls, versions, performances and emotions – never mind composers – all brought to life in truly ‘relevant complexity’. No wonder it took my mind off things.